kg Office, Washington 25, D. C.
fit in southern pine woodlands. W. E. Bond. Forest Service. and by holding good-quality trees until they are ripe for harvesting. ig Administration. 8 p., illus. (L 216, rev.) Price 50.
blication will serve as a guide for repairing and modernizing cotton gins. methods for controlling this pest are given. the State Agricultural Colleges. 4 p., illus. (L 311.) Price 5#. four farmhouses suitable to northern climates are shown. nics. 24 p., illus. (G 8.) Price 50.
nics. 24 p., illus. (G 13.) Price 100. Terminology for use as a common basis for buying, selling, and dL-cussion. P of Do tsGovernment Pritin Office, Washington25D..
produce wholesalers. Marvin R. Kercho, Joseph F.
with the method which uses recording and transcribing equipment. cultural Economics. 26 p. (AB 44.) Price 204.
getting the apples to market. 27 p., illus. (AB 47.) Price 20#. the grower to the consumer. sible for the formulation of policies affecting their utilization. that have influenced the export situation. lg to the present status of crop-bail Insurane. (A 60.) Price 75#. FOR SALE ONLY." Service. 18 p., illus. (C 871.) Price 104.
ion hazards and recommendations for improvement iesur are given. i (C 872.) Price 100.
i of eal p is given. ristensen and Ronald L. Mighell. 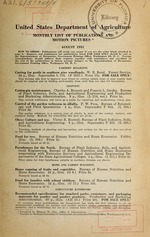 Bureau of Agricultural Economics. al trends in production, demand, and supply of chickens and eggs are described. EIG. Albert Hassall, Mildred A. Doss, and Judith M.1 Humphrey. h helps forestry go forward in the central Ozarks. Forest Service. hle to the Superintendent of Documents, Government Printing Office, Washington 25, D. C.
15 a copy, $1.75 a year, domestic; $2.25 a year, foreign. the 48 States, and the Territories of Alaska, Hawaii, and Puerto Rico. time, 15 minutes. Released 1951. Maine has been supplying timber continuously for almost 200. R uiral r m ite or stro-p .. ..... _...... .. ............... .......... . .................. ..